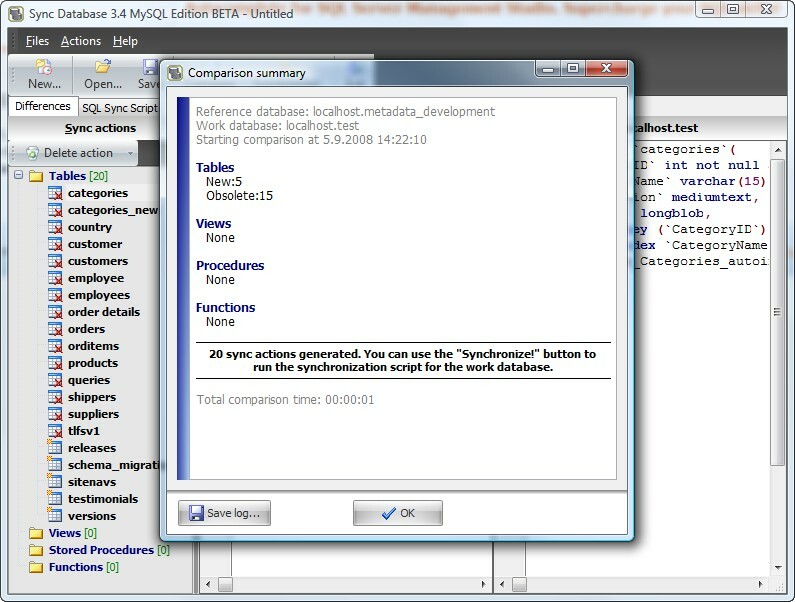 Sync Database MySQL Edition 3.2 is databases & tools software developed by Spectral Core GmbH. Sync Database is an easy solution to compare and sync MySQL databases. Structure differences are quickly determined and displayed, you can review and modify sync actions, as well as generated SQL script. 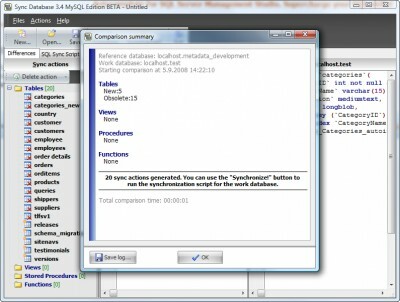 Sync Database synchronizes column, index, constraint information. Conversion between table types is supported as well. This business software is shareware, which means you can download and use Sync Database MySQL Edition 3.2 for free during the trial period (usually for 30 days). At the expiration of the period you will have to buy the databases & tools product for $149.00. Sync Database MySQL Edition 3.2 is available at regnow and Spectral Core GmbH website. Sync Database MySQL Edition 3.2 supports English interface languages and works with Windows 98/XP/Vista. Latest Sync Database MySQL Edition 3.2 does not contain any spyware and/or advertise modules, allowing installing it with no worries concerning valuable information loss. Our website has thoroughly tested business product Sync Database MySQL Edition 3.2, written the review and uploaded installation file (3391K) to our fast server. Downloading Sync Database MySQL Edition 3.2 will take minute if you use fast ADSL connection.